Senior Fantasy Baseball Expert Shawn Childs previews every single batter and pitcher on the Boston Red Sox as we approach the 2018 MLB season! Get ready to DOMINATE! Boston almost had identical seasons over the last two years. They went 93-69 while losing in the league division series. Their offense scored 93 fewer runs while a slight improvement in their pitching staff (3.70 ERA – 2nd). They allowed 26 fewer runs than 2016 (694) thanks to a huge step forward in their bullpen (3.15 – 2nd). The Red Sox were power deprived in 2016 (168 HRs), which was the fourth-lowest total in the league. They were outscored by nine teams in the majors. Headed into early January, Boston only resigned 1B Mitch Moreland while taking the club options on both Chris Sale and Craig Kimbrel. The Red Sox have a contract offer on the table for OF J.D. Martinez while also being in talks with a potential big bat. 2B Dustin Pedroia will miss the first two months of the season with a left knee injury that required surgery in late October. 1B Hanley Ramirez may be released. He had offseason surgery on his left shoulder in mid-October. Boston signed Eduardo Nunez in mid-February to help cover the early season loss of Pedroia. On the pitching side, Eduardo Rodriguez will miss a couple of months with his recovery from right knee surgery. One of the most integral pieces that will determine the success of the Red Sox will be David Price’s return to health. This team is structured to be in the hunt in the AL East again as long as the front of their starting rotation holds up and they add a couple of impact bats to put them in the power hunt going forward. The right bats could make them World Series contenders. Boston has a nice core of four young batters (Andrew Benintendi, Mookie Betts, Rafael Devers, and Xander Bogaerts), which will help this team remain competitive over the next few years. Pedroia will miss time in 2018 due to a left knee issued that required for surgery last October. His overall skill set continued to fade due to multiple injuries over the last four seasons. Dustin lost his value in speed while his power will never end up in an impactful area. His best asset continues his ability to control the strike zone (10.4 percent K rate and 10.6 percent walk rate). Last year Pedroia had a sharp decline in his run rate (27) while his average hit was his lowest output over his last six seasons. Dustin had his best value in the clutch (20 percent RBI rate). With four months of playing time, he’ll offer a slight edge in batting average with 50+ runs, about ten HRs, and 50+ RBI and a couple of token steals. If he has any setback, his value will be even less. Real tough carry in the high stakes market due to his lack of impact in any one category. Betts didn’t live up to his draft day value in 2017, but he did offer value in four categories while maintaining an exceptional RBI rate (19). His contact batting average (.302) was well below his last two years in the years in the majors (.338 and .361) and well short of his 2014 season in the minors (.395). Mookie played through a couple of minor injuries. His K rate (11.1) is exceptional while making a nice step forward in his walk rate (10.8). His best value came against lefties (.306 with five HRs and 23 RBI over 124 at bats) with a great BB:K ratio (23:12). Betts didn’t hit over .300 in any month in 2017 with his lowest value coming in July and August (.234 with 33 runs, five HRs, 35 RBI, and nine SBs over 218 at bats). His swing path remains balanced, but Mookie did have a career low line drive rate (16.8 – 18.7 in his career). Great foundation skill set with the ability to hit anywhere in the first four slots in the batting order. Betts will be a future batting champ with adding strength in five categories. Seems overpriced in the early draft season (ADP of 7) based on his final 2017 stats, but his talent screams foundation player. Don’t sleep on his 2018 value > .325 with 100+ runs, 25+ HRs, 100+ RBI, and 30+ SBs with more upside if Boston adds more strength in their starting lineup. Benintendi put himself in the 20/20 basket in his first full year in the majors. His batting average was the only category to fall short of expectation even with a nice approach at the plate (10.6 percent walk rate and 17.0 percent K rate). His AVH (1.568) fell short of his minor league resume while his CTBA (.336) still has plenty of upside. Andrew handled himself well with runners on base (17 percent RBI rate). His one shortfall in 2017 was his value against lefties (.232 with one HR and 19 RBI over 112 at bats). His game was at its best in every other month last year (April – .333, June – .295, and August – .333) while making him a tougher ride in May (.204), July (.222), and September (.238). His swing path was balanced with the Red Sox in 2017 while having more of an uppercut flavor in his minor league career. Rising star with some clutch ability (.400 with two outs and runners in scoring position) plus he hit the most HRs (5) against the Yankees. Next step: .300+ BA with 100+ runs, 25+ HRs, 100+ RBI, and 25+ SBs. I’m going to go out on a limb in early January to say Martinez signs with the Red Sox. After missing the first five seasons with a right foot sprain, J.D. crushed eight HRs and 19 RBI over his 59 at bats in May. He played well in June (.309 with five HRs and ten RBI) and July (.291 with eight HRs and 22 RBI). Detroit shipped him to Arizona just before the trade deadline. His power came quickly in the desert (five HRs and 12 RBI over his first 27 at bats with the Diamondbacks) leading a monster finish to the year (.302 with 47 runs, 29 HRs, and 65 RBI over 232 at bats). Over his last 1,488 at bats, Martinez has 105 HRs and 274 RBI. This pace projected over 550 at bats would be 39 HRs and 101 RBI. His K rate (26.2) is below the league average (20.3) while showing improvement in his walk rate (10.8). J.D. dominated lefties (.376 with 12 HRs and 29 RBI over 93 at bats). His rise in power was due to a massive HR/FB rate (33.8), which was well above his career average (19.4) plus a rise in his fly ball rate (43.2 – 37.9 in his career). A great power hitter with a massive contact batting average over the last four seasons (.441, .402, .425, and .431). Martinez will hit the ball hard with loft while attacking the ball in the strike zone. In this lineup, I would expect him to see a career-high in RBI chances with a floor of 35+ home runs. Maybe the next Manny Ramirez in Boston’s starting line – .290+ hitter with 100+ runs and 120+ RBI. Bogaerts had regression in his fourth season with the Red Sox. His swing path produced too many ground balls (48.9 percent) and a short fly ball rate (30.2) and HR/FB rate (7.2). Even with a step up in HRs (21) in 2016, Xander didn’t have a high upside power swing (HR/FB rate – 11.4), but he did show more life in this area in his minor league career. Both his K rate (18.3) and walk rate (8.8) came in above the league average while showing some fade in his K rate (15.4 in 2015 and 17.1 in 2016). Even with a down season, Bogaerts hit for high average (.303) before the All-Star break with solid runs (50) and RBI (41) over 320 at bats. He struggled in July and August (.198 with three HRs and 16 RBI). His fade mid-summer was due to hand injury. Talented player with a balanced skill set. I like his trend in speed while I don’t know the right area to place his power. To be safe, I’d say .280+ hitter with 80+ runs, 15+ HRs, 80+ RBI, and 15+ SBs while understanding his game could come quickly in multiple areas. Moreland handled himself well in his first season with the Red Sox. He set career highs in plate appearances (576), at bats (508), runs (73), and RBI (79). His average hit (1.800) is in a range that could produce 30+ HRs with a few more at bats. Mitch’s approach at the plate (K rate – 20.8 and walk rate – 9.9) was the best of his career. He hit 21 of his 22 HRs vs. RB pitching (.246 with 65 RBI over 435 at bats) while still having at bats risk against lefties (.247 with one HR and 14 RBI over 73 at bats). Moreland played his best ball in August (.342 with six HRs and 18 RBI over 76 at bats) after losing his way in July (.145 with no HRs and four RBI). I love to believe in more upside, but I can’t see him being on the field enough against lefties if Hanley Ramirez can play the field in 2018. More of a 20/75 guy with a chance to find his way in battle average. In 2017, we saw multiple first basemen with lesser skill sets blast their way to career years, so Mitch may be overlooked by many Fantasy owners on draft day. Over four seasons by age 20 in the minors, Devers hit .296 with 236 runs, 49 HRs, 258 RBI, and 26 SBs over 1555 at bats. His power made a step forward at AA (.300 with 18 HRs and 56 RBI over 297 at bats) leading to his ticket to the majors. With Boston, Rafael continued his power swing (10 HRs and 30 RBI over 222 at bats). In the majors, he struck out 23.8 percent of the time compared to 17.0 percent in his minor league career. Devers projects to have a league average walk rate (7.7) while showing some underlying speed (18 SBs in 2016 at High A). In the majors, he hit a high volume of ground balls (49.1 percent) with strength in his HR/FB rate (17.2). The most impressive part of his short ride in the majors was a .400 batting average vs. lefties with two HRs and four RBI over 50 at bats. Excellent upside developing power hitter with the ability to drive the ball to all field. His power last year wasn’t a fluke, and his approach at the plate should lead to a successful second year in the majors. A young Pablo Sandoval approach with Ryan Howard type swing. A conservative view would be .280 with 80+ runs, 20+ HRs, 80+ RBI, and a handful of steals while understanding his lefty bat could push his way into the middle of the Red Sox batting order. He’ll hit over 40 HRs in the near future. Winning prize as the 14th option off the board in the early draft season. Bradley missed time twice last season. The first coming over 11 days in April with knee injury and a week in late August a left thumb issue. Jackie had a slight step back in his K rate (22.9) and walk rate (8.9) while remaining close to league average in both areas. He held his own vs. lefties (.276 with three HRs and 18 RBI over 116 at bats), which was an improvement of his skill set (.244 against lefties in 2016 with three HRs and 17 RBI). His swing lost value vs. RH pitching (.235 with 14 HRs and 45 RBI over 366 at bats). Most of his failure came at home (.219 with 12 HRs and 38 RBI over 257 at bats). Bradley only played well in June (.353 with four HRs and 15 RBI over 102 at bats). He had slight drop in his HR/FB rate (14.5) from 2015 (17.9) and 2016 (18.1) while continuing to hit plenty of ground balls (49.0 percent). This season Jackie needs a correction in his CTBA (.330) and a rebound in his average hit (1.644). Backend roster filler with streaky value. Bradley may get a chance to bat at the top of the Red Sox order with Dustin Pedroia out for a couple of months. With 500+ at bats, .260 with 75 runs, 20 HRs, 75 RBI, and a few steals. Over 671 at bats in the majors, Vazquez hit .261 with 79 runs, seven HRs, 64 RBI, and seven SBs. His bat played well in 2017 over the last two months of the season (.322 with four HRs and 12 RBI over 121 at bats), which may put him in line to earn more at bats in 2018. Christian doesn’t strikeout a ton (18.6 percent of the time) with a short walk rate (4.9). He appeared to have upside in 2011 at A Ball (.283 with 18 HRs and 84 RBI) while failing to repeat his power at any level after that season. Over eight years in the minors, Vazquez hit .266 with 40 HRs, 267 RBI, and 15 SBs over 1928 at bats. More of a defensive catcher with a chance offer double digit power with 400+ at bats. Ramirez could be a roster casualty if Boston does add a couple of more bats via free agency. Last year his average hit (1.775) fell in line with his last two seasons (1.710 and 1.764), but Hanley was a lost cause with runners on base (11 percent RBI rate) after posting an elite number in this area in 2013 (19), 2014 (19), and 2016 (19). He played through a bum left shoulder most of the season, which led to only 18 games at first base and offseason shoulder surgery. Ramirez regressed for the fourth straight season in K rate (15.5, 16.4, 16.5, 19.4, and 21.0) while posting a career average walk rate (9.2). He struggled against lefties (.179 with six HRs and 12 RBI over 106 at bats) after dominating in this area in 2016 (.346 with 11 HRs and 30 RBI over 127 at bats). Professional bat with above average approach at the plate when healthy. His DH only tag will lower his draft value. In my thoughts at the right price, a 20/80 season is well with reach with a neutral batting average at the minimum. Boston hopes to have him ready for the start of the season after having surgery on his shoulder last October. Considering Nunez’s early major league career path, he’s been a nice surprise over the last two seasons. Over his last 1,020 at-bats, Eduardo hit .299 with 133 runs, 28 HRs, 125 RBI, and 63 SBs, His success is well worth a starting job in the majors, but he’ll have to earn his keep as a jack of all trades again in 2018 for the Red Sox. The injury to Dustin Pedroia should create a nice two-month window for starting at-bats. Last year Nunez was a better player against RH pitching (.321 with 11 of his 12 HRs over 336 at-bats). He hit well against lefties (.290 BAA), but his production was much less (one HR over 131 at-bats). Eduardo did a nice job for Boston over six weeks (.301 with six HRs, 22 RBI, and four SBs) before suffering a right knee issue in September. A nice injury cover when he’s in the starting lineup with his best Fantasy value coming at second base. His skill set should work well over the first two months as a middle infield option for a Fantasy team in deep leagues. With 450+ at-bats, double-digit HRs and 20+ SBs. It’s amazing to see how quickly a prospect with upside can go from 22 with upside to 26 with lost value. Blake plated well in 2014 at AA (.300 with 12 HRs, 55 RBI, and seven SBs over 347 at bats) while offering no value over the last three seasons at AAA (.234 with six HRs, 51 RBI, and five SBs over 441 at bats). He did look the part in 2015 with Boston (.265 with five HRs and 22 RBI over 189 at bats). Over the last two years, he’s struggled to stay healthy while the Red Sox lost confidence in his defensive catching ability. His best chance at playing time in the majors may come at second base with Dustin Pedroia injured. Over short at bats in Winter Ball, Swihart hit .407 over 27 at bats with no HRs and four RBI. Former first-round pick (2011) who may surprise with a clean bill of health. In his ten seasons in the minors, Sandy hit .238 with 24 HRs, 228 RBI, and eight SBs over 2016 at bats. Over the last three years with Boston, Leon hit .251 with 14 HRs and 77 RBI over 637 at bats. He will strikeout (24.6 percent of the time), but Sandy has a league average walk rate (8.3). His power projects well if he had 450+ at bats while doing a surprising job with runners on base (19 percent RBI rate in 2017). Leon is a slightly better hitter vs. lefties (.247 with two HRs and 16 RBI over 73 at bats). Platoon player with streaky value if he’s playing well. Brock Holt (IF) – Over the last five seasons, Brock has been Boston’s top utility man. He hit .264 in his career with the Red Sox with 13 HRs, 126 RBI, and 27 SBs in 1,392 at bats. Last season Holt played at 1B (2), 2B (31), 3B (9), and OF (11). In 2017, Brock had the least value of his career (.200 over 140 at bats with no HRs and seven RBI). Brock’s role will be similar in 2018 while his opportunity won’t offer any value in the Fantasy market other than a short-term fill in. Marco Hernandez (IF) – With minimal at bats (109) over the last two years with the Red Sox, Marco hit .284 with 18 runs, one HR, and seven RBI. Over seven years in the minors, Hernandez hit .283 with 31 HRs, 284 RBI, and 93 SBs over 2435 at bats. At age 25, he’s likely the player to serve as the top utility infielder for Boston. Bryce Brentz (OF) – Over eight years in the minors, Brentz hit .262 over 2706 at bats with 127 HRs, 462 RBI, and 20 SBs. Last year at AAA, Bryce hit .271 with 31 HRs and 85 RBI over 450 at bats. Longtime minor leaguer who could very easily lose his ticket to the majors by another free agent added to the roster. Sale lived up to his expected value in 2017 in his first year in Boston. Chris set a career high in strikeouts (308) and growth in his ERA (.290) while leading the AL in Ks per 9 (12.9) for the third time in his career. He’s pitched over 200 innings in each of the last three seasons. Sale held batters to a .208 batting average with similar success against righties (.209 with 21 HRs over 671 at bats) and lefties (.203 with three HRs over 123 at bats). Over his first 21 starts, Chris went 13-4 with 2.37 ERA and 211 Ks over 144.1 innings. He struggled over his last 11 starts in August and September (4-4 with 4.09 ERA with 93 Ks over 66 innings). His slide was due to a spike in home runs allowed (13). Fatigue could have been an issue based on continued failure in his two starts in the playoffs (8.38 ERA over 9.2 innings with 12 Ks). In his career, Sale has his worst ERA (3.78) and WHIP (1.243) in September. His AFB (94.4) rebound to his 2015 level (94.5). 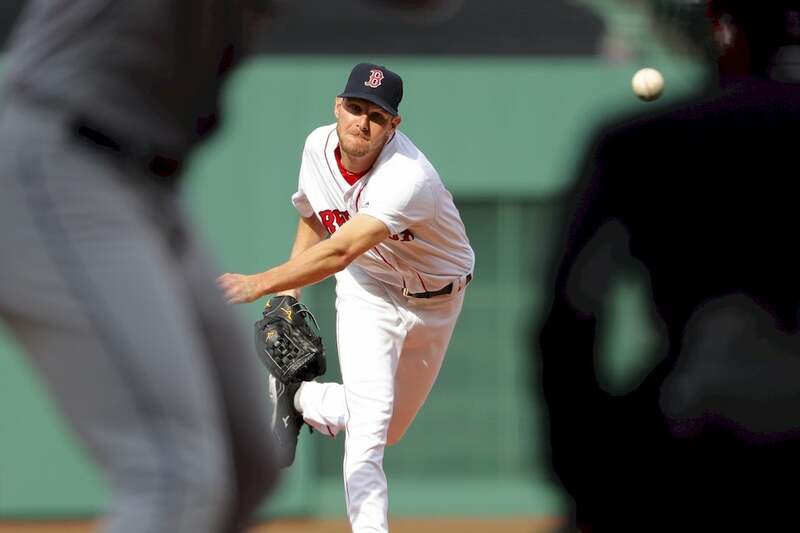 Boston allowed him to throw the most sliders (32.9 percent) since 2011 (36.4) while also featuring an elite changeup. This is a contract year, and he’s in line to receive a huge payday. Great arm with elite stats in all areas. He has a lot to prove in the heat of a pennant race in September and in a championship run in the playoffs. Workhorse arm whose next stop will be a sub 2.50 ERA with repeated command (1.8 walks per nine innings) and similar success in batting average against. From a stats perspective, Price finished almost in line with his career averages despite only tossing only 74.2 innings. His season started with an almost two-month DL stint due to a left elbow issue. David struggled with his command (14 walks) and home runs (six) over his first 28 innings leading to a poor ERA (5.14). After ten starts, Price lowered his ERA to 3.39 thanks to two exceptional starts in July (14 combined shutout innings with 17 Ks). His elbow flared up again on July 22nd (five runs and ten baserunners with five innings). In a relief role late in the season, David didn’t allow a run over 8.2 innings with 13 Ks with follow through in his two playoff appearances (6.2 shutout innings with six Ks). His AFB (94.3) fell in line was his career average (94.3). He threw the most cutters (20.7 percent) of his career with while tapering back his curveball and changeup. Price allowed all of his eight HRs to righties. There hasn’t been a negative report about his elbow over the last few months, so a Fantasy owner will have to wait until he takes the mound in March to place their 2018 gamble. He has a 127-68 career record with a 3.22 ERA and 1,676 Ks over 1,746 innings. His early drafts value (ADP of 144) is more than reasonable for his career resume. Upside of a sub 3.00 ERA with 225+ Ks. If he has any hint of a setback, David becomes undraftable with a future date with Dr. Andrews (TJ surgery). Porcello threw the most first strikes of his career (67.2 percent) leading to strength in his walk rate (2.1). Even with plus command and a career-high K rate (8.0), Rick allowed a huge number of home runs (38 – 1.7 per nine innings) with a step back in his walk rate (1.3 in 2016). Over three years with Boston, he has a 42-36 record with a 4.17 ERA and 519 Ks over 598.1 innings. Unfortunately, Porcello has two disaster years (9-15 with a 4.92 ERA and 11-17 with a 4.65 ERA) with the Red Sox. He struggled with both RH (.287 with 17 HRs over 432 at bats) and LH (.286 with 21 over 392 at bats) batters. Rick did pitch better on the road (3.67 ERA and 1.246 WHIP over 90.2 innings with 74 Ks) with no value at home (5.43 ERA and 1.518 WHIP). His AFB (92.7) was a career high. In 2016, Porcello threw four edge pitches (four-seamer – .197, curveball – .203, changeup – .177, and slider – .192), but each options lost value last season (four-seamer – .276, slider – .229, curveball – .278, and changeup – .325) while struggling badly with his sinker (.318). Tough call here. I like his command and improving K rate, but his lost of life in the strike zone is a problem. It can be one of two issues – underlying arm issue or lost thought process and execution. Pitchers that pitch for teams with winning records tend to be winning investment. With no decline in velocity, Porcello looks to be a bounce-back candidate in 2018. Possible 15 wins with a sub 3.75 ERA and 175 Ks. Pomeranz had his best overall career in the majors in 2017. He went 17-6 while matching 2016 in ERA (3.32). His K rate (9.0) was just above his career average (8.8) while still having issues with his walk rate (3.6). Drew struggled over his first ten starts (5-3 with a 4.24 ERA and 64 Ks over 51 innings). Over the last four months of the season, he went 12-3 with a 2.93 ERA with 110 Ks over 122.1 innings. Pomeranz had a tough time against lefties (.293 with three HRs over 147 at bats) while doing a good job vs. RH batters (.240 with 16 HRs over 512 at bats). His lack of command limits his depth in games while setting up some disaster innings. In 2016, Drew had a forearm issue that could be a sign of a future elbow issue. His average fastball (91.3) fell in line with his career average while relying heavily on his plus curveball while barely adding in a cutter. Coming off a career year with some concern with a drop-in velocity late in the year. A third pitch and better command away from more upside. Focus on his WHIP (1.353) when making a draft day decision while understanding the risk and reward in this type arm. His overall career path points to a sub ERA (3.50) with 175 Ks, but my gut tells me a lost season with a battle with elbow issues and possibly TJ surgery. A knee issue plagued Rodriguez over the last two seasons leading to multiple trips on the DL. In October, he had surgery to repair a ligament in his right kneecap area. His expected return to the mound will be six months at the minimum with a full recovery expected. Even with a battle with command in April (14 walks over 23.1 innings), Rodriguez pitched well over his first ten games (4-1 with a 2.77 ERA and 59 Ks over 55.1). His knee flared up in his first start in June (seven runs, eight baserunners, and four home runs over five innings) leading to a six-week DL stint. Eduardo struggled over next nine starts (5.47 ERA and 1.48 WHIP) after returning to the mound. His stuff started to show his electric upside over his first four starts in September (1.78 ERA with 30 Ks over 25.1 innings). HIs AFB (93.3) is trending backwards. All of his pitches lost velocity, which has to be tied to his knee issue. Rodriguez features a changeup as his second-best pitch followed by a slider and a low value cutter. HIs K rate (9.8) was a career high while still needing to make some gains in his walk rate (3.3). Special arm if he can sort out his knee problems. The talent to post a sub 3.00 ERA down the road with 200+ Ks. I’m buying at a discount if his spring progress puts him on track to miss minimal time. Hector had a 70-51 record over 1,105 innings in Mexico with a 3.88 ERA and 839 Ks. Velazquez made a step forward in 2016 (14-4 with a 2.41 ERA with 207 Ks over 216.2 innings) leading to him signing with the Red Sox. Last year over 19 starts at AAA, his arm held value (8-4 with a 2.21 ERA and 79 Ks over 102 innings). This led to eight games in the majors (3-1 with a 2.92 ERA and 19 Ks over 24.2 innings). Velazquez finished 2017 with 11 shutout innings in the majors with ten Ks). He did show some downside with Boston against lefties (.290 with a five walks and eight Ks over 31 at bats). His AFB (90.8) is below the league average while his sinker (.150 BAA) and his changeup (.222 BAA) have a chance to be upside pitches. Interesting arm as Hector could offer short-term value with a starting role in the majors. Player to follow this spring if he’s awarded with a starting with Boston. Ride him if he pitched well while holding the eject button if he shows disaster downside. Over four seasons in the minors, Beeks had a 3.78 ERA and 374 Ks over 428.1 innings. He showed growth at AA in 2017 (5-1 with a 2.19 ERA and 58 Ks over 49.1) with some success at AAA (3.86 with 155 Ks over 145 innings). His K rate (9.6) made a strong move forward last year, but he struggled with his walk rate (3.5) over the last two years. Jalen has a low 90s fastball with questions about his ability carry velocity deep into games. His changeup projects as his second-best pitch while also adding a curveball and slider. Possible early season backend starter to cover Eduardo Rodriguez. He’s close to being an option in the majors with his best early value coming in relief. Kimbrel was the second-best closer in baseball in 2017 behind Kenley Jansen. Craig found his command (1.8 walks per nine innings) leading to an explosive K rate (16.4). He picked five wins while converting 35 of 39 saves. Righties only hit .109 against him with two HRs over 128 at bats while also holding LH batters to a low batting average (.178). Kimbrel had an ERA under 2.75 in every month, but he only earned 12 saves after the All-Star break. HIs AFB (98.7) was the best of his career with batters only hitting .134 against it. HIs curveball remains an elite asset (.197 BAA). 2017 was almost an identical match to 2012 (1.01 ERA with 116 Ks over 62.2 innings. Special arm if he’s throwing strikes while still being a top reliever with a step back in command. With a career 1.80 ERA and 772 Ks over 470.1 innings, Craig should be at the top of your save list in 2018. The key to a rise in saves is closer games by the Red Sox. More of the same with a chance at a huge jump in saves if game flow works in the right direction. After stalling as starter in the minors (22-25 with a 3.67 ERA and 420 Ks over 399.1 innings), Boston moved Barnes to the bullpen in 2015. He struggled at both AAA (4.06 ERA) and in the majors (5.44) that season. Matt started to blossom in the bullpen last year (3.21 ERA over his first 54 games covering 46 innings with 54 Ks). A back issue late in August led to a trip to the DL and bad finish to the year (5.59 ERA in September over 9.2 innings with three HRs allowed). He still needs to improve against LH batters (.261 with four HRs allowed over 92 at bats). Barnes didn’t throw as hard (95.6) as 2016 (97.6), but his stuff was tougher to hit (four-seam fastball – .208 BAA and curveball – .195). Developing reliever who needs more work on his walk rate (3.6). The Red Sox placed a bet on Thornburg to be an elite setup man in 2017 based on one season of success. Unfortunately, he didn’t throw a pitch with Boston due to a right shoulder injury (thoracic outlet syndrome). Tyler was one of the better relievers in baseball in 2016 after the All-Star break (3-0 with a 1.69 ERA, 11 saves, and 42 Ks in 32 innings). Over 22 innings from late July until mid-September, he didn’t allow a run. Over 219.2 innings in the majors, Thornburg has a 2.87 ERA with 220 Ks. His K rate (12.1) jumped by more than three strikeouts per nine innings in 2016, but his walk rate (3.4) still needs plenty of work. His AFB (95.2) was a career best. He dominated batters with all three pitches (FB – 1.82 BA, changeup – .121, and curveball – .177). Tyler was a FB pitcher (44.8 percent) in 2016 so could have disaster in his game with less life on his pitches. Short resume with plenty of concern with his expected value in 2018. CLICK HERE TO READ THE REST OF SHAWN CHILDS’ IN DEPTH TEAM OUTLOOKS!